We ditched the mayo from this sandwich staple and boosted the nutrition with crunchy vegetables. *I recommend using poached chicken, as grilled chicken has a tendency to dry out. 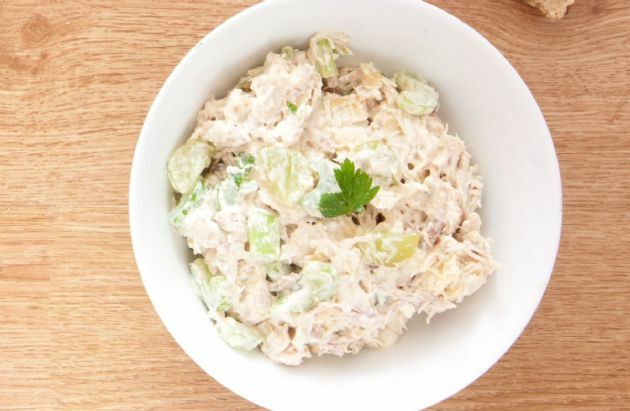 This is a basic chicken salad recipe; feel free to customize it with your favorite veggies, herbs, fruits, and nuts. Try 1 cup sliced grapes, 1/4 cup toasted chopped pecans and 1 cup arugula. Jicama is a root vegetable that tastes like a cross between an apple and a potato. Look for them in the international produce section of your supermarket. The brown roots should be firm and heavy, and the stem end should be dry and odorless. Combine all ingredients in a large mixing bowl, cover and chill for 30 minutes. Refrigerate for up to four days.